For details, visit the event page on Facebook. The Kenosha Community Foundation has awarded 28 grants totaling $51,501 to non-profit organizations and projects serving Kenosha County residents. Listed below are the grants that the Foundation awarded from five of its Field of Interest Funds endowment funds – the LaFave Family Fund, the OMC Legacy Fund, Women’s Fund, Kenosha Arts Fund and the Kubasiewicz Family Trust. • Fleeing Artists Theatre to support fall 2019 performances at local high schools and Summer Shakespeare. • Girls Scouts of Wisconsin for its Promise Program that provides leadership education for girls from low income neighborhoods in Kenosha. • Kenosha Achievement Center to support the pre-employment assistance to special needs clients. • Kenosha Public Museum Foundation to support enhancing of the museum’s education resources on Native American populations and history. • Lemon Street Gallery and ArtSpace to support its StudiO-K ceramics program for Hope Council clients. • Shalom Center of the Interfaith Network to support its Expanding Opportunities for Homeless Families program. NOTE: Additionally each year, the LaFave Family Fund supports a scholarship at the College of Communications of Marquette University’s (Ms. LaFave’s alma mater). • Center for Collaborative Research to support its Press-On Wheels After School print- and papermaking workshops at the Boys and Girls Club of Kenosha. • Faith, Hope and Love for its Duffels for Kids program which works in conjunction with law enforcement, foster care, homeless, and domestic abuse shelters, schools and Children’s Hospital of Wisconsin. • Girl Scouts of Southeastern Wisconsin to help provide financial assistance to girls to attend its outdoor summer camp. • Kenosha YMCA to support its Dedicated Dads program that supports single fathers – a collaboration with the Kenosha / Racine Community Action. • Kenosha Achievement Center for Voyage Transportation Assistance for young adults with disabilities. • Shalom Center for its Kids Succeed program. • Boys and Girls Club of Kenosha for their Teen Vision and Learning program. • Girl Scouts of Southeastern Wisconsin for its Trail to Confidence program for under-served urban and latina girls living in economically challenged neighborhoods. • Faith, Hope and Love for their Duffels for Kids program. • Kenosha Literacy Council for their Women in Focus interactive workshops on women’s issues. • Sharing Center to help provide free transportation for disadvantaged clients in Western Kenosha County. • Women and Children’s Horizon to help with the emergency needs of women and children at their emergency shelter. In addition, the Women’s Fund will also support the Kenosha Women’s Network’s 2019 Susan B. Anthony – Women of Influence Awards. • LGBT Center of Southeastern Wisconsin for their youth summer camp program. The Kenosha Community Foundation announces that local not-for-profit organizations can now apply for 2019 grants from four Field of Interest Funds that it manages. •	OMC Legacy Fund – Supports programs and activities that improve the general welfare and enhance the quality of life for youth in the greater Kenosha community. Last year, the Foundation awarded five grants from this fund – the average grant was $2,140. •	LaFave Family Fund – Supports programs and organizations that promote understanding, communication and a sense of tolerance between individuals and groups through education, arts and humanities. Last year, the Foundation awarded 11 grants from this fund – the average grant was $2,411. •	Women’s Fund – Supports programs that create opportunities for women and children through responsive philanthropy and community involvement. Last year, the Foundation awarded 11 grants from this fund – the average grant was $973. •	Kenosha Arts Fund – Supports non-profit organizations which offer arts programming with the purpose of enhancing the culture, economy, and quality of life in Kenosha County. Particularly interested in creative initiatives which expand and diversify the arts in Kenosha, address needs that sustain developing organizations or efforts, and/or have educational value. Last year, the Foundation awarded five grants from this fund – the average grant was $900. In January 2018, the Foundation awarded 32 grants, totaling $53,000, from these four funds. Applications must be received by the Foundation no later than 4 p.m. Friday, September 28, 2018. Committees of volunteers from around Kenosha County will help select award recipients. Grant awards will be announced in January 2019. Applications for 2019 grants from the Foundation’s Unrestricted Funds will be released in December 2018. The Kenosha Community Foundation awarded grants totaling $56,150 to 13 Kenosha County not-for-profit organizations and projects from the income earned by the Foundation’s unrestricted endowment funds. 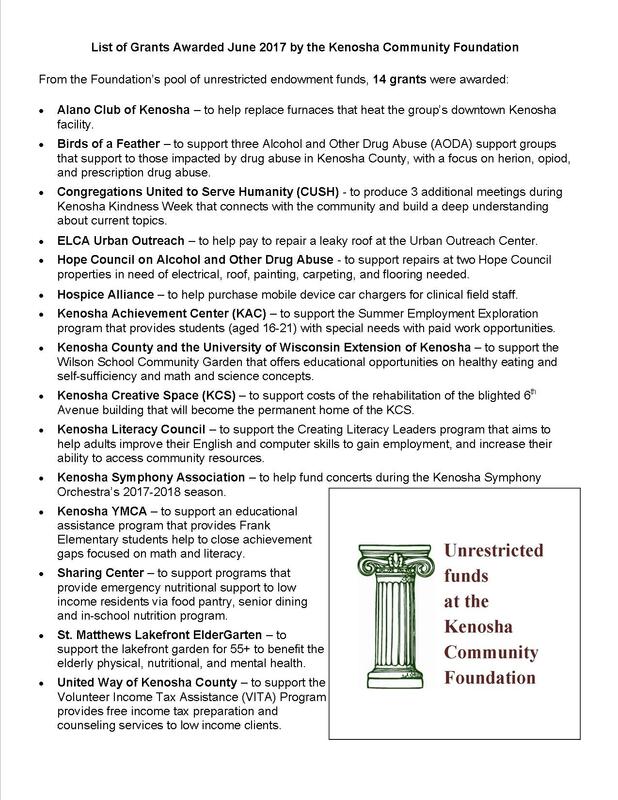 According to Executive Director Robert Schneider, the Foundation awarded these grants in alignment with the #WhatKenoshaNeeds community needs assessment survey that the Community Foundation conducted (in partnership with the Kenosha County UW-Extension) in November 2017. With these grant awards, the Foundation completes its competitive grant making for 2018. This year, the Foundation awarded competitive grants to not-for-profit organizations totaling $109,299 – a two percent increase from 2017 ($107,000). Earlier in January 2018, the Foundation awarded $53,149 in grants from its four Field of Interest funds. • Boys and Girls Club of Kenosha to support its “Gus the Bus” Transportation Project that provides free transportation to youth that attend the center several days per week. • Hospice Alliance to support the purchase of medical lock boxes that will securely store opioids and other pain medications which are critical for comfort care at the end of life. • Kenosha Achievement Center (KAC) to support the organization’s transportation services which serves beneficiaries that attend their programs, including: Early Intervention, Early Head Start and Sprouts, Summer Employment Exploration, Adult Day Service, the Summer Employment Exploration. • Kenosha (KAFASI) for its Volunteer Transportation Service for Kenosha residents over 60 and adults with disabilities. • Kenosha Literacy Council to support the “Creating Literacy Leaders” program that helps adults improve their English and computer literacy skills to gain employment or post-secondary education. • Kenosha Public Library to support the expansion of the Bookmobile Fleet with smaller vehicles to bring their services seniors, youth and the physically challenged in more communities. • Kenosha YMCA to support the “Frank Neighborhood Project” with Achievement Gab which provides educational enrichment assistance to students at the Frank School, focusing on Math/Literacy. • National Alliance on Mental Illness (NAMI) Kenosha County for its Rideabout Rewards pilot program that distributes bicycles, helmet and locks to participants in the Community Support Program (CSP), Comprehensive Community Services (CCS) program, and at Bridges Community Center for exercise and transportation. • The Shalom Center of the Interfaith to support the Individuals in Need of Nightly Shelter (INNS) (homeless shelter) program, targeting clients with substance abuse and mental health issues. • The Sharing Center to support its Resource Center and Emergency Service Programs that helps rural residents of Kenosha County. • Women and Children’s Horizons for its program that serves adult/children of domestic violence and sexual assault, and its batterers’ treatment program. The Foundation awarded grants totaling $56,000 to 14 Kenosha County not-for-profit organizations and projects. According to Executive Director Robert Schneider, these grants are derived from the income earned by the Foundation’s Unrestricted endowment funds. “Nearly all of these grants directly support the operations of 14 local not-for-profit organizations that serve our Community, this includes emergency capital projects and equipment purchases,” Schneider said. With these grant awards, the Foundation completes the its competitive grant making for 2017 – earlier in January, the Foundation awarded $51,000 in grants from its Field of Interest funds. This year, the Foundation awarded competitive grants to not-for-profit organizations totaling $107,000 – a 19 percent increase from 2016. Sonja Katt plans to attend Carthage College. Cassandra Millard plans to attend Carthage College. Lindsey Orthmann plans to attend the University of Wisconsin-Milwaukee. Cooper Scarmardo plans to attend the University of Wisconsin-Madison. To receive the $1,500 scholarship, Bradford High seniors must plan to attend a college or university in Wisconsin. Nineteen students from Bradford High applied for the scholarship. who plan to pursue a two-year or four-year degree at an accredited Wisconsin college or university. Jazz saxophonist Donny McCaslin and the quartet that performed with the late David Bowie on his multi-Grammy Award winning, final album – “Blackstar” – will be a featured at University of Wisconsin-Parkside’s Jazz Week with a Thursday, March 9, FREE afternoon master class and evening concert. Concert: 7:30 pm; $10 for adults, $5 for students with ID. To purchase tickets for the evening concert, go on-line to: uwparksidetickets.com and select the Music tab. Tickets are also available UW-Parkside box office (262-595-2564). McCaslin says that his latest album “Beyond Now” on Motema Music “is dedicated to (Bowie) and to all who loved him.” For “Beyond Now”, McCaslin’s band was comprised of core personnel that performed on ”Blackstar” – among them, bassist Jonathan Maron, drummer Jason Lindner and guitarist Nate Wood are scheduled to perform at the UW-Parkside master class and concert. The quartet’s repertoire is expansive – it is comprised of two Bowie songs, covers of Deadmau5, MUTEMATH, and the Chainsmokers, as well as compelling McCaslin originals including the title composition, inspired by a track inspired by a song McCaslin recorded for “Blackstar” that didn’t make the album. To see a video preview of McCaslin in concert (at a NPR Tiny Desk concert in January 2017), go to: www.youtube.com/watch?v=oIbFjfH0erI. Again this year the University of Wisconsin-Parkside’s music department will present Jazz Week – from March 6 through March 10. This week-long showcase of jazz workshops and performances – all performed in UW-Parkside’s world-class Bedford Concert Hall. For more information on Jazz Week contact Russ Johnson, UW-Parkside Director of Jazz Studies. (russell.johnson@uwp.edu). The Kenosha Community Foundation has awarded 26 grants totaling over $51,000 to 22 non-profit organizations and projects serving Kenosha County residents. The Foundation awarded the grants from four of its Field of Interest Funds endowment funds – the LaFave Family Fund, the OMC Legacy Fund, Women’s Fund and Kenosha Arts Fund. • Boys and Girls Club of Kenosha to support an English Language Learner program in conjunction with the Kenosha Literacy Council for 2016-2017 school year. • Center for Collaborative Research to help promote its mobile printing press workshops that target Kenosha area fine arts students. • Community Expressions to support the program’s writing workshop for Kenosha area residents. • Fresh Inc. Music Festival for Emerging Composers and Musicians 2017, held at UW-Parkside and organized by Fifth House Ensemble. • Kenosha Achievement Center to support its Employment Options pre-vocational services program for adults with disabilities. • Kenosha Creative Space for its Emerging Music Performance Series that target music students in the Kenosha Unified School District. • Kenosha Public Museum Foundation to support its upcoming ‘Re-Riding’ History Exhibit. • Shalom Center to support its Kids Succeed engagement program for homeless children. • Faith, Hope and Love to support Duffels for Kids, a collaboration with the Kenosha County Sheriff’s Office. • Kenosha YMCA to support its Dedicated Dads program that supports single fathers, a collaboration with Kenosha / Racine Community Action. • Sharing Center to support three nutrition support programs serving Westosha low-income students. • Kenosha Achievement Center to support the Sprouts playgroup and depression discussion group programs. • Kenosha County Association for Home and Community Education (KCAHCE) for its participation in the Wisconsin BookwormsTM reading program. • Kenosha Literacy Council for their Women in Focus workshops. • Lemon Street Gallery and ArtSpace for an after-school ceramics program for Washington Middle School and Harborside Academy students. • Shalom Center its Kids Succeed program. • Women and Children’s Horizon to support activities for children and families its emergency shelter. • Kenosha Creative Economy Strategic Plan initiative led by Kenosha’s Commission on the Arts. • Hospice Alliance for the Music of the Soul that provides music experiences program for its patients and families. • Southport Quilters Guild of Kenosha to support its annual quilt show held at the Kenosha Public Museum. • Kenosha Chamber Choir to produce a choral concert focused on youth suicide prevention.